Many countries, particularly in Asia, are still in possession of VOC (1602–1799) documents. The Arsip Nasional Republik Indonesia (ANRI), for example, currently holds one of the largest collections. This review, however, will deal solely with the archives currently preserved in the Nationaal Archief (Dutch National Archives) at The Hague. Despite the usefulness of this archive to students and researchers of Tokugawa Japan, its holdings are so intimidatingly numerous that it can be hard to know where to begin perusing them. This small introductory piece, therefore, is meant to give the reader, viz. potential users, a general idea of where to look and what to expect. After the first Dutchmen arrived in Japan in 1600, they soon managed to obtain the right from shogun Tokugawa Ieyasu to establish a trading post at Hirado in 1609. After the Portuguese were expelled from Japan in 1639, the Dutch were forced to move their trading post from Hirado to the artificial island of Dejima off the coast of Nagasaki in 1641. The movements of the Dutch during the decades to come would be mostly restricted to this small island. An exception formed the occasional trips to the city of Nagasaki and its surroundings, as well as the yearly visit of the chief of the trading post to Edo in order to pay homage to the shogun, thanking him for the privilege of being able to trade in Japan. As the Dejima trading post turned into one of the most profitable trading posts of the VOC in Asia, the Company did everything it could to maintain its privileges and keep competition at bay. Information played a vital role in its strategy. The VOC demanded meticulous record keeping from its employees concerning all aspects of trade—cargo lists, ships journals, general administration, bookkeeping, and an extensive correspondence between the company’s various trading posts in Asia and its directors in the Dutch Republic. From roughly the early 1630s, the chiefs of the Dutch trading posts throughout Asia were also required to keep so-called Dagregisters, or diaries, keeping track of everything noteworthy that occurred. In the case of Japan, besides details concerning the proceedings at the trading post and the court journey to Edo, these diaries note contemporary news, rumors, and the political climate at the shogunal court. Any information that might give the Dutch merchants an edge in their constant struggle for favorable trading conditions was recorded. As such, these documents are invaluable reference material concerning matters of trade as well as the broader Tokugawa society, particularly its politics. At the moment, several projects are underway to make these Dagregisters available to an international public. In Leiden, Cynthia Viallé and Leonard Blussé are working on an English summary, and the Historiographical Institute of The University of Tokyo has been editing and publishing these diaries in the original seventeenth- and eighteenth-century Dutch as well as in modern Japanese translation. These projects will certainly do wonders to help these sources reach beyond a small group of specialists, but, as anyone working with languages will know, nothing beats working with the original materials. Those who are able to consult the original documents, therefore, are highly recommended to pay a visit to the National Archives in The Hague, The Netherlands. Most of the records regarding the Dutch presence in Japan are kept in a separate archive, namely, the Archive of the Dutch Factory in Japan (Nederlandse Factorij in Japan, NFJ: 1.04.21). This archive is comprised of two sections. The first section contains documents from both the VOC period and part of the Netherlands Trading Society (Nederlandsche Handel-Maatschappij, NHM) period, and covers the years 1609–1842. The second section contains documents from the NHM era, covering the years 1843–1860. This division is related to the manner in which the archive made its way from Japan to the Netherlands. In 1852, J.H. Donker Curtius, then chief of the Dutch trading post in Japan, was ordered by the Governor-General to send the trading post’s archive to Batavia. After consultation with his predecessor, Donker Curtius decided he could send the documents that originated prior to 1800 to Batavia without any effects on current trading conditions. Eight years later, the documents from the years 1800–1842 were also sent to Batavia, where they were mixed with the documents from the VOC period. The first part of the archive was sent to the Netherlands in 1862. It took until 1906 before the Dutch ambassador in Tokyo was able to send the documents related to the period 1842–1860 to the Dutch Ministry of Foreign Affairs. The current archive at the National Archive largely maintains the changes made to it whilst in Batavia. All individual items such as trade books, letters, diaries, minutes, and ordinances have been separated and are easily accessible searching by year. One has to keep in mind though that the trade year differed from the calendar year. The trade year was dictated by the monsoon, causing the ships to arrive usually sometime around August and to leave around end of September/begin of October, which marked the end of the trading year. Most documents from the period 1609–1842 are in good condition, and a very large number of documents from the seventeenth century survived the sands of time, unlike the general VOC archive, which shows many gaps for this time frame. 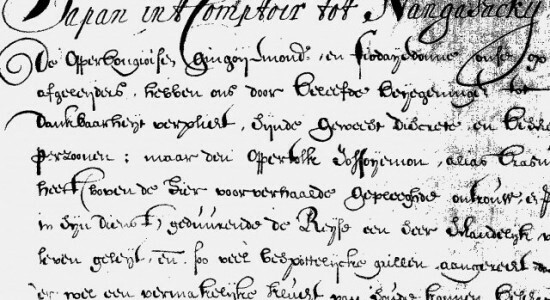 Whenever one comes across a document that is unreadable or incomplete, one should consider looking for the same document in the general VOC archive (Verenigde Oost-Indische Compagnie, VOC: 1.04.02). Since information needed to be distributed amongst the trading posts and the Dutch Republic, there is a chance a copy might exist in, for example, the so-called Overgekomen Brieven en Papieren (OBP), or Received Letters and Papers. These are the reports from Batavia sent to the Company directors in the Dutch Republic, and, having been often copied by professional clerks, they are written in beautiful and clear handwriting. Being aware of some general matters will help make your trip to the National Archives as rewarding as possible. First of all, the National Archives are located at Prins Willem Alexanderhof 20, less than a minute on foot from Den Haag Central Station. You might also take special notice of their somewhat irregular opening times: Wednesday to Friday, 10:00–17:00; Tuesday, 10:00–21:00; and every other Saturday, 11:00–17:00. On Sundays and Mondays they are closed. Furthermore, when arriving at the front desk, you will be required to register with your passport. This procedure does not take long and after you receive your day pass, or a card of a more permanent nature, you can request archival pieces on the very same day. Requests can be made in the study room of the National Archives, after which it will take about 30 minutes for your documents to arrive. If you are on a tight schedule, you might opt to make requests in advance, from the leisure of your home, using the internet; just look up the inventory codes on the Archives’s website, place your reservation request, and your documents will be waiting for you the next day. Useful though the service is, it is necessary to register in order to be able to use it. Also be aware that, although the number of documents you can request is quite high, you can only have four boxes at your desk at any given time. The rest will be kept for you at the pick-up desk in the study room. If microfilms of the documents in question are available, you may not request the originals. The microfilms, however, are freely available, without request, in a section at the back of the study room. They are of good quality and if you bring a USB stick, there is an option to make PDF copies, free of charge. A quick note on the rules of the study room: laptops and paper notebooks are allowed, but subjected to inspection upon entering. Ball pens or other writing materials that need ink are strictly prohibited. Instead, use the pencils provided to you by the National Archives. Should you, during your visit, run into any problems, you will find the knowledgeable and friendly staff always willing to lend a helping hand. Finally, I would like to note that during the ten years that I have been making use of this archive, many regulations have been subject to change. Therefore, for the most up-to-date state of affairs I direct you to their website. Image: Nationaal Archief, Den Haag, Archief van de Nederlandse factorij in Japan, 1.04.21, inventarisnummer 89, microfilm 2895-3, Deshima Dagregister 1675-1676 Folio 100. Provided by J.J.A. Knoest.